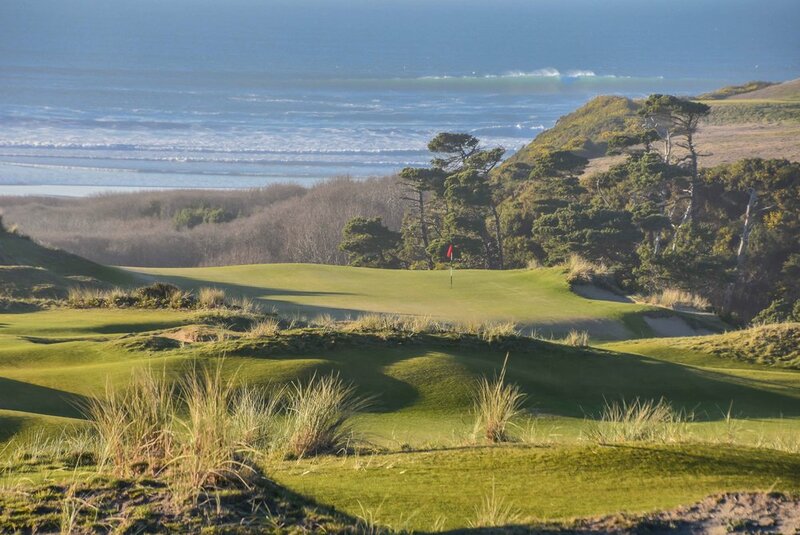 The RGV Tour Finale: Bandon Dunes — PJKoenig Golf Photography PJKoenig Golf Photography - Golf Photos For Those Who Love The Game. This was it, the time had finally come for the RGV Tour to come to an end. The final putt would be holed and the final ace attempt would be made. It was going to be a glorious mix of accomplishment and sadness. 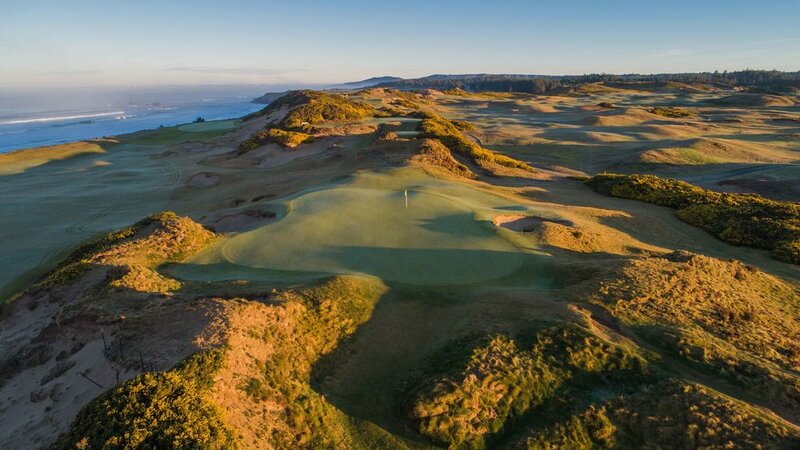 There was no better setting on earth for the experience than Bandon Dunes. The invites were sent out and only a few brave souls ended up making the journey to Bandon Dunes. Here is the hall of fame roster for those that made the journey to the end. 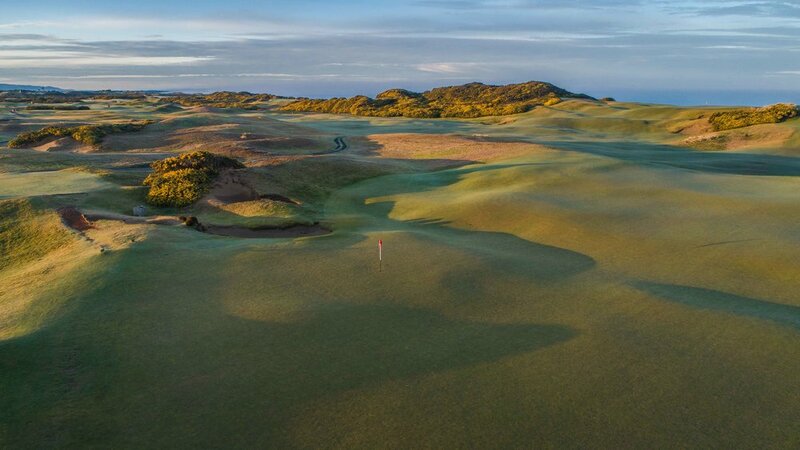 You have 5 different golf courses to choose from at Bandon Dunes and first up on the finale festivities was Old Macdonald or “Old Mac.” The golf course was designed by Tom Doak and Jim Urbina. 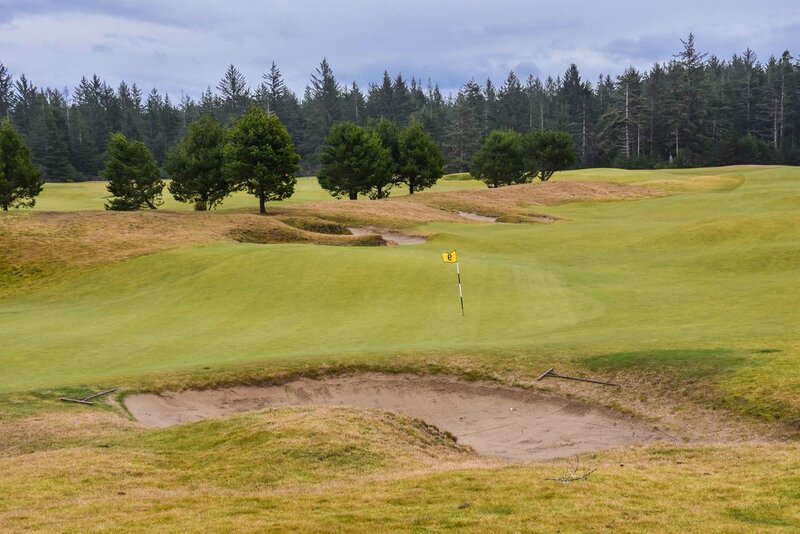 The idea was a simple one, to build the golf course that legendary architect Charles Blair Macdonald would have built on the Oregon coast. The 7th hole at Old Macdonald finishes on the ocean. Born in 1855, CB Macdonald was a driving force in early American golf. He built the first 18-hole course in the United States, won the first U.S. Amateur, and later created some of the most influential golf courses in America. MacDonald identified 21 different designs or template holes from the greatest golf holes in the British Isles. CB would use these template holes on his American designs. The templates are pretty easy to identify and with a little knowledge, you can be a part of the cool kids club. The holes are similar from course to course but they are not replicas. Each hole was designed specifically for that particular property and the genius resides in how they fit into the land. Using these classic concepts of design, Tom and Jim have built my current favorite course on the property. 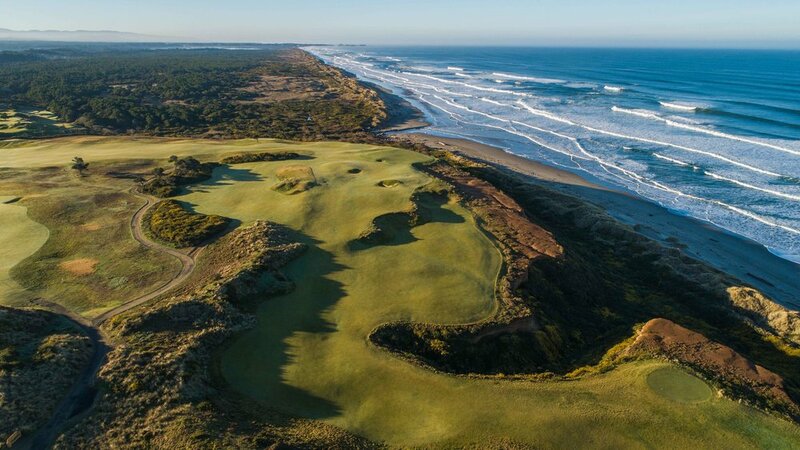 I say current because on just about every visit to Bandon Dunes my favorite course on the property changes. When I first visited Bandon Dunes, I had no education on golf architecture and Old Mac was at the bottom of the list. Times have changed. The large “Biarritz” green on the 8th hole at Old Mac is a template design. The golf party began to pick up steam as we took off on Bandon Preserve to gamble for some push-ups. The match was up and down over the first twelve holes and when we arrived on the 13th and final hole the stakes were high. In one of my more spectacular moments, I rolled in an unlikely 35 foot birdie putt to send Evan and Captain Joe to the ground. Evan knocked out his 50 push-ups easily, but Joe struggled mightily. Bandon Preserve rests in the foreground with Bandon Dunes beyond the creek. The next day, the sun was shining on the original David McLay Kidd course at Bandon Dunes. Our group took full advantage of the perfect conditions with some high quality play. It was the penultimate round on The RGV Tour and the end was rapidly approaching. The 16th hole at Bandon Dunes is a fan favorite and one of the best golf holes on the entire property. The par 3 6th hole as the sun rises. RGV Tour staff caddy, AK, caddies hard. After the round at Bandon Dunes it was time to get down to business… the business of delivering a $20,000.00 check to charity. For as long as I can remember, I have always wanted to either give or receive one of those large fake checks and this was my moment to make that dream come true. Believe it or not, it only took one take to get this right. That stupid smile on my face afterwards makes me laugh every time I watch this. 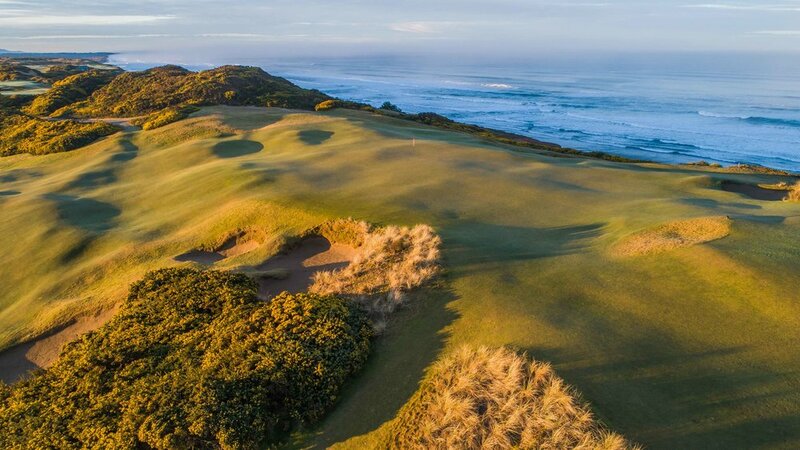 Almost everything that a golfer could want is located on property at Bandon Dunes. However, our group was feeling adventurous and we headed out to the Arcade Tavern in downtown Bandon. They have pool tables, darts and a jukebox. The trick to the Arcade is that you have to get to the jukebox early and load it up with some classic selections. Like an amateur, I only put on 2 songs and went back to my game of pool. Just like that, the jukebox was hijacked and we ended up listening to death metal for 2 hours. Since Pacific Dunes was left out of the lineup, it decided to show off. Suddenly it was upon me, the very last round of golf on the RGV Tour. The setting for the final round was Bandon Trails and it was the 405th different golf course played over the past 365 days. The tour had visited 47 states, played golf with 793 people, and driven 35,576 miles to get to this point. It was raining and we did not care. After this guy climbed off of my Callaway, I rolled in the very final birdie of the RGV Tour. Included in that final round would be the very last attempt for me to make a hole in one on The RGV Tour. The RGV ace hunt only had four opportunities remaining. In my entire golfing career, I estimated that I have made somewhere around 11,000 attempts at the feat. On the RGV Tour alone, I have made around 2,700 attempts. That means I am 0 for 13,700. Actuarial companies have placed the odds of the average golfer making a hole in one at 12,500 to 1. For the tour professional the odds are 2,500 to 1 and the low handicapper around 5,000 to 1. Statistically speaking I should have 2.74 aces. For a brief moment, I thought fate might intervene on the par 3 17th at Bandon Trails. I can only imagine the level of hysteria that would have been achieved had this ball disappeared. I would have ripped my jacket off, high kicked everyone in the face, ran straight into the Pacific Ocean and died. When finishing up a life changing adventure, it is natural to look back on where the journey began. In this case it was 365 days ago at Chambers Bay. Even though I am wearing the same jacket in both of these videos, I am decidedly a very different person beneath. From patience to perseverance, the tour has changed me as a man and made me a better human being. The people that have joined me on my journey have reinvigorated my belief in the human spirit. The generosity that was displayed will never be forgotten. I would like to extend a huge and heartfelt thank you to the countless courses that welcomed the tour. To everyone that joined and followed along: Thank you for your golf spirit, you made The RGV Tour something truly special. Just as the final putt had dropped, it was clear what needed to happen next. It was emergency nine time at Shorty’s!! Shorty’s is a nine hole David Mclay Kidd designed par 3 course and unfortunately, there were no emergency nine aces. After the emergency nine had wrapped up, I headed back to Seattle where it all began. It was time to go on Q it up Sports with Aaron Levine and bring the RGV Tour full circle. After the cameras stopped rolling, I headed out into the RGV to record the tour’s final podcast with Evan Johnsen. As snow fell onto Seattle that Sunday, the tour had finally come to an end. The RGV Tour would like to leave you with this summary article on Golf.com. Fourteen months ago @PatrickjKoenig quit his sales job and bought an RV. With his newfound freedom, he hit the open road and used his savings to play over 400(!!) courses in the last year.